It’s paradoxical how the same technology designed to help manage our lives is now unmanageable. The ‘Collective Mind’ of the Internet, Social Media and Email has a ‘mind of its own’ and is overrunning us. The irony is that we live in an age of unprecedented inter-connectedness, while simultaneously being more fragmented, disconnected and impotent in communication than ever. Mindfulness has emerged as a meaningful response to this challenge. 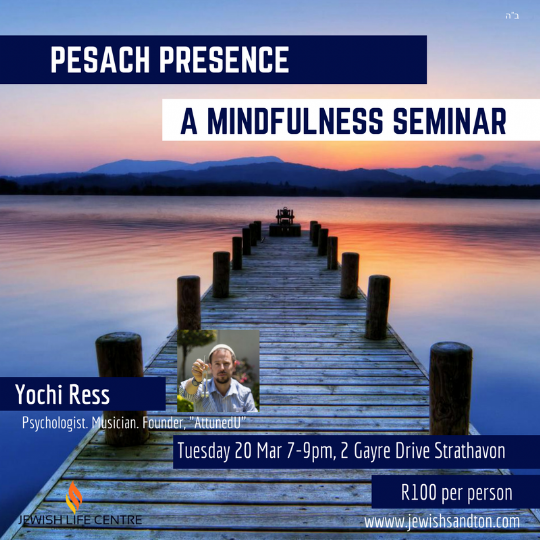 Yochi Ress shares ancient Jewish practices of mindfulness that we can all use to be more present and live more meaningfully. Clinical and Organisational Psychologist, Professional Musician and ‘Sound Meditation’ specialist. Facilitator, he has helped many teams and organisations throughout South Africa to reach a zone of ‘peak-performance.’ From 2011 to 2014, Yochi helped run Nedbank’s flagship leadership and culture transformation program, after which he started up his own company: ‘Attuned Consulting’. In 2016, Yochi was hired by the multiple award-winning creative company TBWA (through its subsidiary OpenCo) to develop their leadership and mindfulness program, culminating in an exciting new product called ‘Openomics’. His passion is exploiting the science of ‘sound’ to help us bypass the rational monkey-mind realm that we often get trapped in.